In recent years, mindfulness and meditation-based processes and interventions have received increasing clinical and scholarly attention in the trauma field due to their theoretical and clinical relevance to the etiology, maintenance, and treatment of posttraumatic stress disorder (PTSD). 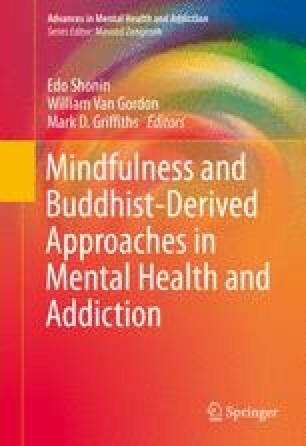 Indeed, there has been a proliferation of literature documenting associations between mindfulness as well as meditation and PTSD symptomatology and supporting the efficacy of such interventions for the treatment of PTSD. Mounting empirical evidence indicates that mindfulness- or meditation-based skills and/or intervention programs may serve as effective stand-alone or adjunctive interventions for PTSD. For populations with a high probability of exposure to intense or chronic potentially traumatizing events, such as police or military personnel, mindfulness- or meditation-based interventions may prevent the development of persistent PTSD. The goal of this chapter is to elucidate the construct of mindfulness in terms of the potential utility in the conceptualization and treatment of PTSD so as to stimulate further scholarly and clinical thought in this domain. Notably, distinct, though related, practices such as meditation are included so as to provide a broad-based picture of relevant clinical and empirical landscapes. The most salient research associated with posttraumatic stress/PTSD, mindfulness, and meditation is reviewed, and the clinical implications of mindfulness and meditation for the treatment of PTSD are discussed. Finally, future research directions that may inform both clinical and research efforts are suggested.